County Hall ran the flag up to celebrate local government reform, as thousands of Lancastrians woke up to find themselves in Merseyside, Cumbria, Cheshire and Greater Manchester. Flying over the Preston headquarters of the new, smaller and less powerful county council was a new red and gold flag with the old Lancashire roses on it. Meanwhile, the 108 districts of the old Lancashire came down overnight to just 14 as the biggest shake-up in local government for 80 years became a fact. “We haven’t come across any problems we couldn’t deal with,” said the new Preston’s public relations officer, Mr Geoff Millward. Cracks have appeared in the brickwork of three blocks of multi-storey flats in Preston for the second time since they were built 16 years ago. And they could cost Preston council more than £60,000 to repair. 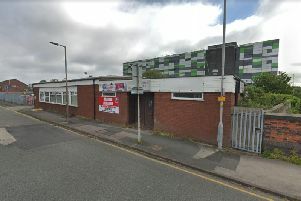 Members of the policy and resources committee agreed to call in the firm which originally built the 16-storey blocks in Moor Lane to repair the cracks. Borough architect, Mr John Smith, stressed that the blocks - Cumberland, Westmorland and Northumberland houses - were not in any danger. Following council approval the builders will move in to clothe the buildings in scaffolding for the second time since they were built. Residents of the 288 flats will not need to be moved out. “In about 1965 we found that the brickwork on these blocks was cracking, and we approached the contractors who had built them and asked them to do something about it,” Mr Smith told the committee. “They made it good. But about 18 months ago we found it was cracking again. Former Preston social club badly damaged in late night blaze. As a streaker 25-year-old Stephen Dudley decided he was no great success. “I was caught,” he said. But Preston magistrates thought his performance was worth every penny of £35 - the fine they imposed in court after Dudley pleaded guilty to insulting behaviour likely to cause a breach of the peace. The first streaker to appear in a Preston court, Dudley was nabbed after police traced his getaway car after his 400 yard dash from his home in Balderstone Street, Preston, to the end of Broadgate and back, wearing little more than nature gave him. The magistrates heard that Dudley was spotted streaking naked, except for shoes, socks and a watch, by a woman looking out of her bedroom window on to Broadgate. Enquiries led to Dudley, who at first denied being involved, but then admitted he streaked in Broadway between midnight and 1.15am on March 30th. Outside court, Dudley said: “I did it for a £4 bet and a dare after a wine and cider party. I was intoxicated. Now Dudley has to fork out £4-a-week until the fine is paid off.